For the remixed Nintendo GameCube version, see The Legend of Zelda: Ocarina of Time Master Quest. 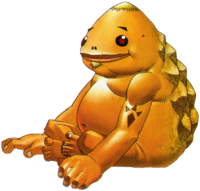 The Legend of Zelda: Ocarina of Time is legendary in gaming circles and is thought of by many as one of the greatest games of the last ten years, winning a massive amount of awards from the gaming community. Ocarina of Time follows the story of a young boy named Link who quests to save the world from darkness. This game is set in a lush fantasy world spanning the course of seven years. 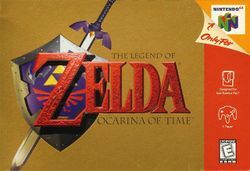 Originally released on the Nintendo 64, Ocarina of Time's success led to it being ported twice to the Nintendo GameCube and also onto the Wii's Virtual Console in 2007. The GameCube ports occurred once as a dual release with The Legend of Zelda: Ocarina of Time Master Quest, and again in a collection titled The Legend of Zelda: Collector's Edition, which did not include Master Quest. A stereoscopic 3D-enhanced port was announced for the Nintendo 3DS at E3 2010, and released internationally in June 2011 as The Legend of Zelda: Ocarina of Time 3D, which also features a version of Master Quest. It was later made available for digital download through the Nintendo eShop. For version differences, see The Legend of Zelda: Ocarina of Time/Versions. European box artwork for Ocarina of Time 3D. USA Launch team card, front. USA Launch team card, rear. This page was last edited on 16 December 2015, at 11:05. This page has been accessed 949,730 times.